The founders of Park & Tilford, grocers, were Joseph Park (1823-1903) and John Mason Tilford (1815-1891). Park & Tilford were founded at 35 Carmine St., Manhattan, in 1840, and their early days were described in the obituaries of their founders. 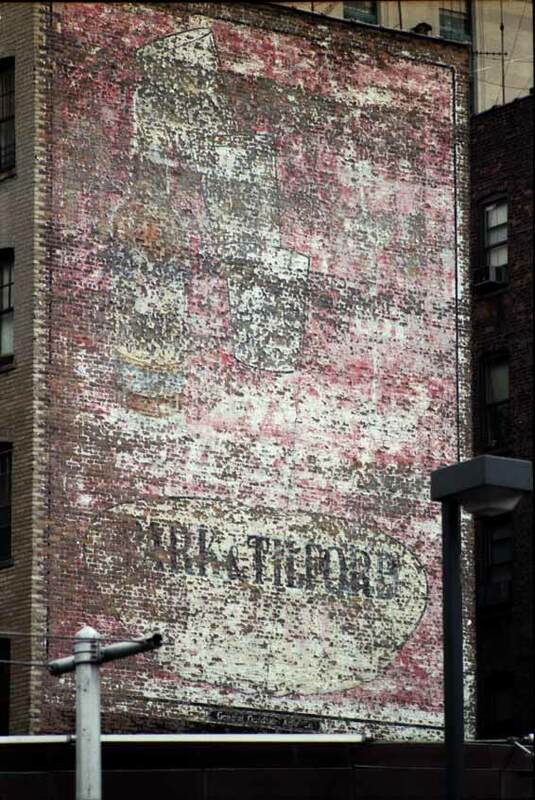 8 January 1891 the following appeared in the New York Times, "John Mason Tilford of the well-known grocery house of Park & Tilford died yesterday morning at his home, at 4 West Forty-ninth Street. He was born in Argyle, Washington County, N. Y., in 1815, and the first twenty years of his life were spent on his father's farm. Being ambitious, he determined to try city life. He came to New-York and found employment in the grocery firm of Benjamin Albro, at Grand & Eldridge Streets. Two years later another ambitious young man, Joseph Park, arrived in the city. He became Mr. Tilford's fellow-clerk. The two young men grew to be fast friends, and often discussed the possibilities of establishing a prosperous business in the steadily-growing city. Three years later they carried their plan into practice and started a store at 35 Carmine Street. Their business grew larger and larger, and they finally acquired four large grocery stores, at 120 and 658 Sixth Avenue, 917 Broadway, and at Fifth Avenue and Fifty-ninth Street, besides having a purchasing house in Paris. About four months ago the partners incorporated their firm into a stock company under the laws of the State of New Jersey. The secret of the success of Mr. Tilford and his partner was that they always gave their customers the full worth of their money, paid strict attention to the business, and kept away from outside speculations, turning every dollar of profit into extending the business of the firm. Mr. Tilford was also a Director of the Greenwich Bank and the New-York County Bank. In 1840 he married Miss Jane White of Washington County. His two sons, Charles E. and Frank, survive him, and are in the company. Fifteen months ago Mrs. Tilford died. Mr. Tilford had been suffering from chronic affection of the heart, and his bereavement aggravated the trouble and hastened his death. He was a man of domestic habits and did not belong to any societies or clubs. Mr. Tilford will be buried in Woodlawn Cemetery." 4 April 1903 the following appeared in the New York Times, "Joseph Park, one of the founders of the firm of Park & Tilford, and formerly the President of the corporation, died yesterday in his apartments in the Hoffman House at the age of seventy-nine years. He was born in Rye, N. Y., on May 24, 1823. He obtained work as a clerk in a grocery in this city when he was a very young man, and he manifested early great business aptitude. He was very economical, and he saved sufficient means to embark in business with John M. Tilford, the two men founding the firm that developed into a large corporation. In 1890, when the business was reorganized, Mr. Park, who had always been recognized as the controlling and dominant factor in the business, was elected President of the corporation, and he continued at the head of affairs until failing health complelled him to give up the active management of the business. He left two sons, George C. Park and Hobart J. Park. Mr. Park had large estates in Harrison and Rye. He was a member of the Union League, Manhattan, American Yacht, and New York Yacht Clubs, the Aldine Association, and the American Museum of Natural History, a Director of the New York, New Haven and Hartford Railroad Company, the Bank of the Metropolis, the Plaza Bank, and of the New York County National Bank, and a member of the Chamber of Commerce and the Produce Exchange." This ad from 1872 for the Urbana Wine Company's Sparkling Gold Seal wines sent customers to Park & Tilford at Broadway and 21st St. This ad from 1882 for Park & Tilford listed addresses at Broadway and 21st St., 6th Ave. near 9th St., and 6th Ave. at 38th St. Also, the rue de Lafayette, Paris! This ad from 1911 showed a variety of New York locations, including 6th Ave. near 9th St. This ad from 1913 was intended to sell Park & Tilford candies. A Park & Tilford shop front featuring wines can be seen in this photograph on the Museum of the City of New York website. The date is ca. 1890, but the location is not identified. A second generation of Parks and Tilfords involved in the business consisted of George Carpenter Park (1852-1916), Hobart Joseph Park (1855-1948), and Frank Tilford (1852-1924). George C. Park's obituary notice in the New York Times, 7 July 1916, read, "George Carpenter Park, eldest son of the late Joseph Park, one of the founders of the grocery firm of Park & Tilford of this city, died on Wednesday in Flower Hospital, in his sixty-fifth year from heart disease, which was aggravated by a fall here last week. Mr. Park made his home at his country estate, Whitby, in Harrison, N.Y. His wife and one brother survive him." When Frank Tilford died the following appeared in the New York Times, 7 March 1924, "Palm Beach, Fla., March 6.- Frank Tilford, from 1906 to 1923 President of the grocery firm of Park & Tilford, died at 5 o'clock this morning at his residence on Sunset Avenue after a fortnight's illness of infirmities incident to his age. His widow and two daughters were with him and left tonight with the body for New York. Mr. Tilford was born in New York City seventy-one years ago, the son of John M. Tilford, founder of the firm. On his father's death, in 1901, he became Vice President and stepped into the Presidency, in 1906, when Hobart J. Park retired. The business was sold in August, 1923, to David A. Schulte, head of the chain of cigar stores of his name. Mr. Schulte at the time of his purchase called 'Park & Tilford' the 'best retail merchandising name in the country.' Mr. Tilford remained with the concern as Chairman of the Advisory Board. In addition to his grocery interests Mr. Tilford had been President of the New Amsterdam National Bank, trustee and an organizer of the Fifth Avenue Trust Company, one of the founders the Lincoln Trust Company and its Vice President. He had also been President of the Standard Gas Light Company and an official of other light and power companies. He had many philanthropies. In 1902 he presented a bust of Washington to every public school in Manhattan, and for many years he and his wife gave a Christmas dinner to the 'little mothers' of the city. He helped organize the New York School of Applied Design for Women, and to build the Manhattan Eye, Ear and Throat Hospital, of which he was a director. His clubs included the Union League, New York Yacht, Bankers, Lotos and New York Athletic." The following biographical sketch of Frank Tilford was published in 1899 in The Heroes of the American Revolution and their Descendants, by Henry Whittemore. "Frank Tilford, youngest son and business successor to John M. Tilford, was born in New York on July 22nd, 1852, and was educated in the well-known Mount Washington Collegiate Institute. Then he entered his father's store at Sixth avenue and Ninth street, and worked faithfully in one department after another until he had acquired a practical mastery of all the details of the business. In 1890 the company was transformed into a stock corporation and the senior Mr. Tilford became its Vice- President. At his death in January, 1891, Mr. Frank Tilford succeeded him in that office and has continued to hold it ever since. ... Mr. Tilford was married in 1891 to Miss Julia Greer, daughter of James A. Greer and grand-daughter of George Greer, a famous sugar refiner of the past generation. They have two daughters, Julia and Elsie Tilford. Mr. Tilford has long been a member of the Union League Club and is also a member of the Republican, Colonial, Lotos, Press, New York Athletic and other clubs, and of the Sons of the Revolution. His city home is on West Seventy-second street. It was chiefly designed by Mr. Tilford himself, and ranks as one of the handsomest edifices in that particularly handsome part of the city." Hobart J. Park retired early from the business and outlived the others. As described in the New York Times, 7 January 1948, "Hobart J. Park, son of the founder of Park & Tilford, provisions concern, died yesterday in St. Barnabas Hospital for Chronic Diseases, the Bronx, after a long illness. His age was 93. Born in this city, Mr. Park received his education abroad. His father, Joseph Park, founded the food concern in 1840. Records do not show when Hobart Park entered the firm but he was a director of the business at his father's death in 1893. The elder Park willed his business to his son who sold out his interest in 1906 to Frank Tilford, then president. After the sale in 1906, Mr. Park retired and devoted his energies to philanthropic work. His first wife, Elizabeth M. Ives Park, who died in 1893, was the daughter of James Merritt Ives, member of the noted lithographing firm of Currier & Ives. A few years later he married the former Edith P. Stabb, who died five year ago. ..."
In 1909 the New York telephone directory listed 8 Park & Tilford locations in New York. The Park & Tilford Building at 310 Lenox Ave. (corner 126th St.) was constructed in 1908 and housed a Park & Tilford grocery. Currently (2014) it is home to the well-known Red Rooster Restaurant and other shops. Park & Tilford were grocers initially, but also sold wines and cigars. This ad from 1919 was intended to sell their imported cigars. After their sale to the Schulte Cigar Chain they became primarily distillers and importers of wines and liquors. The sign above shows a liquor bottle and is likely no earlier than the end of Prohibition, 1933. This wall of 865 Walton Ave. at 161st St., the Bronx, faced west towards Yankee Stadium. Presumably it was visible from the elevated subway station at 161st St. and River Ave.